Following the decline of disco music in the United States, electro emerged as a fusion of funk and New York boogie. 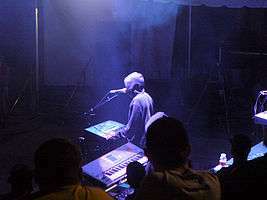 Early hip hop and rap combined with German and Japanese electropop influences such as Kraftwerk and Yellow Magic Orchestra (YMO) inspired the birth of electro. In 1982, producer Arthur Baker with Afrika Bambaataa released the seminal "Planet Rock" which was influenced by the Yellow Magic Orchestra using samples Kraftwerk and drum beats supplied by the TR-808. 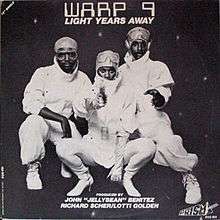 Planet Rock was followed later that year by another breakthrough electro record, Nunk by Warp 9. In 1983, Hashim created an electro funk sound which influenced Herbie Hancock, resulting in his hit single "Rockit". The early 1980s were electro's mainstream peak. By the mid 1980s, the genre moved away from its electronic and funk influences, using harder edged beats and rock samples, exemplified by Run DMC. Electro became popular again in the late 1990s with artists such as Anthony Rother and DJs such as Dave Clarke. A third wave of popularity occurred in 2007. Electro has branched out into subgenres, including Electrocore and Skweee, which developed in Sweden and Finland. The Roland TR-808 drum machine hit the market in 1980, defining early electro with its immediately recognizable sound. Staccato, percussive drumbeats tended to dominate electro, almost exclusively provided by the TR-808. As an inexpensive way of producing a drum sound, the TR-808 caught on quickly with the producers of early electro because of the ability of its bass drum to generate extreme low-frequencies. This aspect of the Roland TR-808 was especially appealing to producers who would test drive their tracks in nightclubs (like NYC's Funhouse), where the bass drum sound was essential for a record's success. Its unique percussion sounds like handclaps, open and closed high-hat, clave and cowbell became integral to the electro sound. A number of popular songs in the early 1980s employed the TR-808, including Marvin Gaye’s “Sexual Healing,” Cybotron’s “Clear,” and Afrika Bambaataa’s “Planet Rock.” The Roland TR-808 has attained iconic status, eventually being used on more hits than any other drum machine. Through the use of samples, the Roland TR-808 remains popular in electro and other genres to the present day. 1982 was a watershed year for electro. 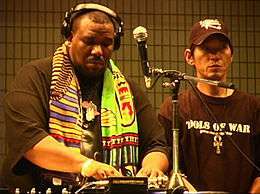 Bronx based producer Afrika Bambaataa released the seminal track "Planet Rock", which contained elements of Kraftwerk's "Trans-Europe Express" (from the album of the same name) and "Numbers" (from Kraftwerk's 1981 Computer World album), as well as Yellow Magic Orchestra tracks such as "Riot in Lagos" (from Sakamoto's 1980 album B-2 Unit), combined with the use of distinctive TR-808 beats. "Planet Rock" is widely regarded as a turning point in the electro genre, "like a light being switched on. ":146 Another groundbreaking record released that year, Nunk by Warp 9 utilized "imagery drawn from computer games and hip hop slanguage." Although remaining unreleased, a pre-Def Jam Russell Simmons produced Bruce Haack's proto hip-hop single "Party Machine" at a studio in Philadelphia. Electro hip hop releases in 1982 include songs by: Planet Patrol, Warp 9, Man Parrish, George Clinton (Computer Games), Grandmaster Flash and the Furious Five, Tyrone Brunson, The Jonzun Crew and Whodini. ↑ "Electro-Funk > WHAT DID IT ALL MEAN ?". Greg Wilson on electrofunkroots.co.uk. Retrieved 2009-12-23. 1 2 Rap meets Techno, with a short history of Electro. Globaldarkness.com. Retrieved on 2011-07-18. ↑ Electro itself is a musical style blending "funk & synthesizers with elements of hip-hop", according to Dent, Susie (2003). "The Language Report": 43. 1 2 "Electro". Allmusic. Retrieved 2012-06-20. ↑ Ishkur (2005). "Ishkur's guide to Electronic Music". Retrieved June 1, 2014. ↑ Electro-Funk : What Did It All Mean?. Electrofunkroots.co.uk. Retrieved on 2011-07-18. ↑ "Anysound". Keyboard. 14 (11): 34. 1988. ; as cited in Théberge, Paul (1997). Any sound you can imagine: making music/consuming all counts of technology. Middletown, Conn: Wesleyan University Press. pp. 197. ISBN 0-8195-6309-9. ↑ Dayal, Geeta (2013). The Grove Dictionary of American Music. Oxford Music Online. pp. Roland TR–808 – via Oxford Music Online. 1 2 3 4 5 6 7 Toop, David (2000). Rap Attack 3: African Rap To Global Hip Hop. (Expanded Third Edition) Serpent's Tail, London N4 2BT p.148 ISBN 1-85242-627-6. 1 2 3 4 David Pattie, Sean Albiez (2011). Kraftwerk: Music Non-Stop. A&C Black, 2011. p. 728. ISBN 9781441191366. ↑ Jason Anderson (November 28, 2008). "Slaves to the rhythm: Kanye West is the latest to pay tribute to a classic drum machine". CBC News. Retrieved 2011-05-29. ↑ Broughton, Frank (2007). La historia del DJ / The DJ's Story, Volume 2. Ediciones Robinbook. p. 121. ISBN 84-96222-79-9. Retrieved 25 May 2011. ↑ Sicko, D., Techno Rebels: The Renegades of Electronic Funk, Billboard Books, 1999 (ISBN 978-0823084289), p. 73. ↑ When The Planet Rocked. Electrofunkroots.co.uk. Retrieved on 2011-07-18. ↑ King, SB (2003). "The Fader". The Fader (16-17): 188. ↑ Shapiro, Peter (2005). The Rough Guide to Hip-Hop (2nd ed.). Rough Guides. p. 2005. ISBN 1843532638. ↑ "Electro". Retrieved October 4, 2014. Despite its successes (documented in full on Rhino's four-disc Electric Funk set), the style was quickly eclipsed by the mid-'80s rise of hip-hop music built around samples (often from rock records) rather than musical synthesizers. ↑ D. Lynskey (22 March 2002). "Out with the old, in with the older". Guardian.co.uk. Archived from the original on 16 February 2011. ↑ "Music Definitions - House music : styles". DJ Cyclopedia. 3345. Electro house : Sometimes resembles tech house, but often influenced by the 'electro' sound of the early 1980's, aka breakdancing music, via samples or just synthesizer usage. ↑ "Electro House". Tumblr. Retrieved 12 June 2012. It was in the early 2000s when a big movement of electroclash being mixed with synthpop. Meanwhile, tech house was also becoming more known and gaining some serious buzz. When the two were combined that is when Electro House came to be the way it is now. ... 'Satisfaction' was one of those songs that people would have stuck in their head for days. This song still continues to receive a lot of attention even now. It won world wide rewards as well as make Benny Benassi the father of Electro House. ↑ "Electro versus "electro" (electro house/pop/clash)". MetaFilter. Retrieved 2014-11-10.